and scope of wrecks in the Northern Red Sea will not leave you disappointed. that serves up the most fascinating and enjoyable wreck dives you could hope to experience. After a quick check dive, the Wreck Special leaves no scrap unturned. Abu Nuhas is known locally as ship graveyard. 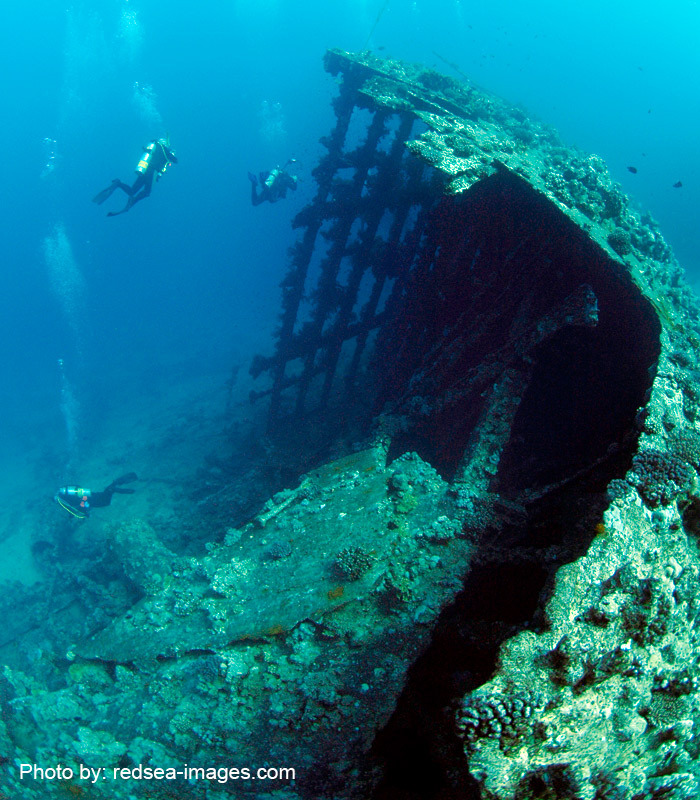 It is home to the oldest wreck in the region – the Carnatic. The photogenic iron ribs show off 19th century workmanship, whilst the Giannis D, lying only a short RIB ride away, is iron clad 20th century beast. The enormous engine room lends itself to an easy penetration dive. The tile wreck, or Chrisoula K, completes the trio. Gubal is where you will find another 3 wrecks, each very different from the last. The Ulysses, Barge and atmospheric Rosalie Moeller surround small Gubal. Moving closer to Sharm el Sheikh is the Kingston, a small 19th century coal barge. And then there is the Thistlegorm. Rediscovered by Jacques Cousteau, the Thistlegorm lies beneath the waves, a monument to Second World War. Her strange army cargo is testament to the forces fighting in Africa. The Dunraven finishes the week with a flourish. The Wreck Special is a week for wreck lovers, but that does not mean you can forget the fish. For every year underwater, the wrecks submit further to the reef. Scorpion fish, nudibranch’s and crocodile fish can be found on almost every wreck. Old dames such as the Carnatic are a haven for fish of all shapes and sizes. Turtles have made their homes on the Kingston, Ulysses and Thistlegorm. Great pods of bottlenose dolphin are frequently spotted around Gubal and Abu Nuhas. Batfish hover under the upturned bow of the Dunraven as cleaner wrasses set to work. Tuna and snapper weave between the railing of the Rosalie Moller. Yes, there is certainly more than metal on this tour. Photographers, dust of that wide angle lens. Almost all of the wrecks lie in locations sheltered from the currents flowing down the Red Sea. Diving is done from both the boat and RIB. By focusing solely on the wrecks of the region, you get more dive time to probe each wreck’s secrets further. For the Wreck Special we recommend a minimum of 50 logged dives.